Home › Articles › Backlinks – What the !#$% are they? Backlinks – What the !#$% are they? Every once in awhile new buzz words show up that might help the website owners out there. Today’s random question asks a few people that I know – if they know what it is. The thing is, that even though you – as a website author might not feel that these words could have any use to you; it’s a good idea to understand them just in case you could utilize it for your own sites benefit. Just a reminder, I’m not a search engine freak, I don’t even care about search engine stuff, this is all about getting readership to your site. Jason’s answer while being short and to the point sums it up for quiet a few people, they just do not recognize the term right immediately as they hear it. Which is okay, after a small conversation explaining the usage of the word, Jason knew all along what it meant and how backlinks can be used to generate traffic. After Jason who is a story author, I decided to ask the same question to the people who I generally write articles for, the webcomic authors,first up is Antoine Gagnon from The Drunken Fools webcomic. New buzzword terms sometimes do not make it globally as fast as they should, but being that this is the internet Antoine has heard the term used before just didn’t recognize it right away. Then came Frank … i’m not going to even pretend to know how to write his last name. While Frank has the right idea bout backlinks, is he really doing enough by sticking with the community he is in to share backlinks to each other? To get more audience? Quick answer: No. Finally I asked the question from a member of the WordPress Theme Review Team, Chip Bennett. While Chip definitely knows what a backlink is, he doesn’t care about that sort of thing, i.e. increasing traffic to your site. Backlinks are links to your website that are put *anywhere* else on the internet that leads to your site. Compare it to freeways that connect to your city, your city being your website. The on-ramps you have accessing the freeways to get to your site the more traffic will be able to reach your site. Pretty much the equivalent of stapling your business cards up so a passersby will notice and find your information. While that being said, the majority of the people passing your business card, i.e. backlink there will pass it up and ignore it, but that other portion is new traffic, new readers that you did not have before. There are many ways of utilizing a backlink, previously methods included sharing link images with other authors, posting your site on listing services or telling friends to tell friends (word of mouth) to post on their sites. However, did you notice what I did above in this article? I backlinked to their sites just for participating in this discussion. They now have a possibility for new traffic coming to their site by just being involved in a couple minutes of conversation. Have you ever noticed the “Incoming Links” section of your dashboard? 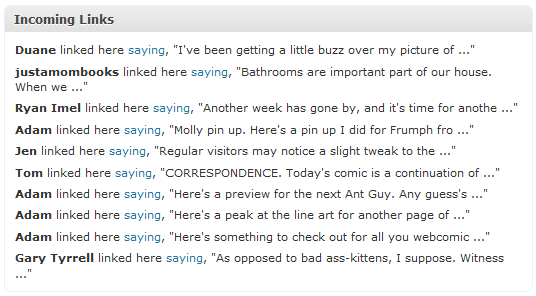 These are all backlinks to my Frumph.NET site, they show me who linked here. This is automatically done in the WordPress dashboard to help out the blog owner find that information out. .. I think I can explain the justamom backlink and revelance to to Frumph.NET .. wait, no.. no I can’t. Maybe using my Easel theme. Backlinks, huh? You mean like this? Sort of. While you did place a link where someone can get to it. The better method would be able to have them within the context of the post itself. Well, it still worked lol. One of my readers told me they found http://www.dreamcastersduel.com/comic from the link above! Under what circumstances would you place the link within one of your posts? How might I find myself under the “Recent Comics” category? like so, does that amount to a backlink? As you say above, better to get someone to actually post it on their website where some actual traffic might stumble across it once in a great while. I’m a search engine optimization guy. I’ve been one for two years. Backlinks are one way links to your site that are like “votes” for your website. They help improve your relevance and can raise your site in the search engines. How do I link within the content itself? Again, the post editor has buttons in the editor you can use to add links. Yes, I understand. That is if I want a link in my post or page but if I want a comment that I leave for others should have a link in it. Just plain regular content?